The HP OMEN Gaming Laptop & Desktop PCs Revealed! HP just launched the OMEN by HP line of gaming PCs. Their new OMEN gaming PCs have reputedly been engineered to give esports and competitive gamers the edge to perform at their very best. Let’s take a look at the new HP OMEN gaming laptop and desktop PCs! The 2017 OMEN Gaming Laptop & Desktop PCs Revealed! 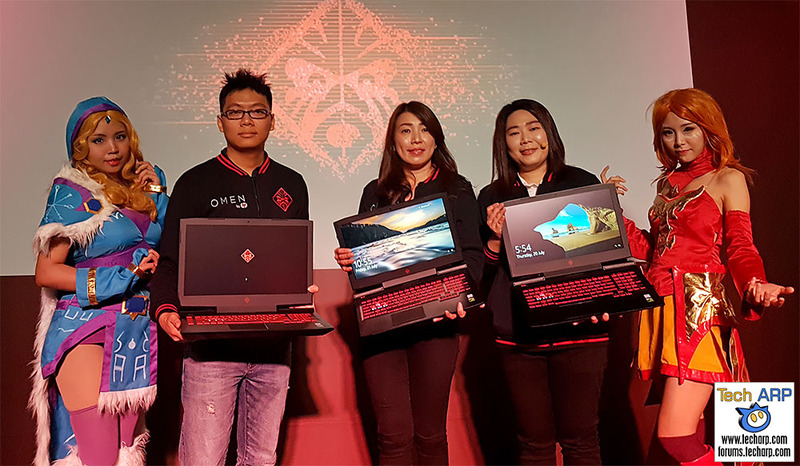 The highlight of the HP OMEN launch event was this presentation by Stacey Gan, HP Market Development Manager (Consumer Notebook) on the key features of the new OMEN gaming PCs. Check it out! The new OMEN gaming desktop PC was inspired by the OMEN X desktop. It leverages key features from the OMEN X desktop, like the ability to easily upgrade components, and improved cooling, to allow gamers to push the envelope of the system’s gaming performance. Supports up to dual NVIDIA GeForce GTX 1080 Ti graphics cards in SLI, or dual AMD Radeon RX 580 graphics cards in CrossFire mode. Powered by the 7th Generation Intel Core i7 or Core i5 CPUs with unlocked options for overclocking. Improved thermal engineering with all-around edge vents and optional liquid-cooling capability. Optional PCIe SSD or SSD + HDD storage options. OMEN Command Center with Overclocking improves CPU performance on-the-fly. Network Booster prioritises gaming traffic to reduce latency in online games. The HP OMEN gaming laptops will be available in two sizes – the HP OMEN 15 with a 15.6″ display, and a HP OMEN 17 with a 17″ display. These gaming laptops feature more expansion capabilities, additional ports and more VR compatibility. The HP OMEN 15 supports up to the GeForce GTX 1060 with Max-Q, or the Radeon RX 550. The HP OMEN 17 supports up to the GeForce GTX 1070, or the Radeon RX 580. Powered by the 7th Generation Intel Core i7 quad-core processors. Improved cooling thanks to a multi-fan, multi-heatpipe, multi-exhaust thermal solution. Integrated dual speakers tuned by Bang & Olufsen, and boosted by HP Audio Boost. Dragon-red keyboard with red-accented WASD keys, white backlights and 26-key rollover anti-ghosting capability. Option of 4K display / 1080p 120Hz display with NVIDIA G-Sync / 1080p 60Hz display with AMD FreeSync. Single access panel for easy HDD, SSD and RAM upgrades. VR-ready configurations available for virtual reality gaming. The HP OMEN Desktop is currently available, with prices starting at RM 5,999 / ~US$ 1,429. The HP OMEN 15 gaming laptop is currently available, with prices starting at RM 4,499 / ~US$ 1,069. The HP OMEN 17 gaming laptop is currently available, with prices starting at RM 8,899 / ~US$ 2,119. Previous : The AMD Ryzen 3 Specifications & Availability Revealed!